I have reset PRAM / SMC and tried a number of troubleshooting steps as outlined in the apple support docs. I've also tried Opt + Detect displays in the Displays preference panel. I would like to watch a log file while I plug in the display (thunderbolt to DisplayPort) to see if I can track the issue down. What should I be looking for either in the console app or by tailing and grep'ing an individual log file in terminal? The monitor is an LG widescreen. There are no new display drivers. Around the same time, I've been having trouble installing the January security update but no idea if that is related. The attached image shows a suspicious looking entry in the console. 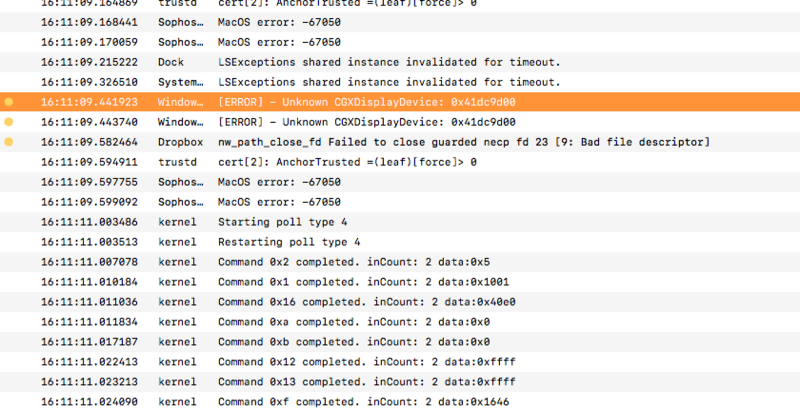 Browse other questions tagged display thunderbolt displayport logs .